It seems like ages ago that I got my first look at Superbrothers: Sword & Sworcery EP back at GDC ’10. We later checked in with the guys from Superbrothers at E3, where we discovered the shift to the iPad. An iPhone version is still in the works, but it’s not expected to appear for another month yet. 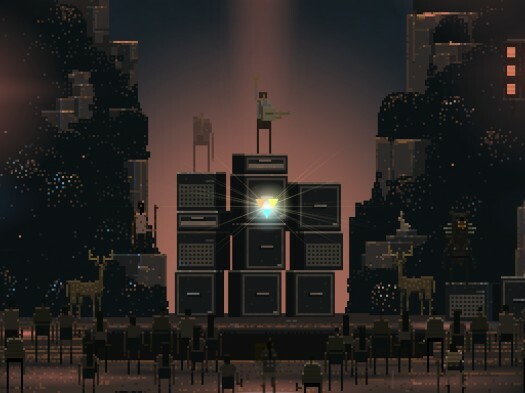 Now, as mentioned in our preview earlier this week, a big part of your enjoyment of Sword & Sworcery will come from discovering things on your own, taking your time, and enjoying how well the pixel art melds with the music and vice versa. Since so much of the game is the actual experience, I’m going to try something new and write this review in layers starting with high level commentary that spoils basically nothing straight on down to actually discussing the themes of the game and spoiling everything. I’ll leave it up to you to decide when to stop reading, just keep in mind if you want the most out of the game you should go in to it knowing little more about it other than it’s a cool looking adventure game with great music. In fact, if you’re holding out for the game on your iPhone, I’d try to just avoid all the iPad commentary entirely, as difficult as that likely will be for the next month. Anyway, on with the show. 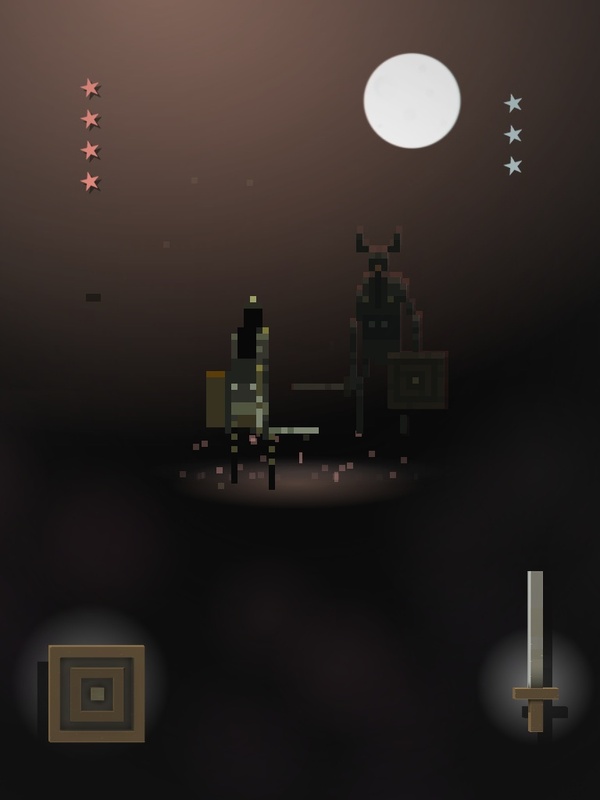 Sword & Sworcery is a point and click adventure game with art by Craig D. Adams and music by Jim Guthrie. Craig and Jim have been working together for years now, as evident by more than a few videos on Vimeo by the duo, and Jim has an impressive catalog of music on iTunes which is also worth checking out. After getting mixed up with Capybara Games, Sword & Sworcery is the first time they’ve worked together on something interactive. The game was built from the ground up with both the music designed for the game as well as the game designed for the music, making it one of the most unique gaming experiences I think I’ve had on my iPad. As mentioned in the preview, controlling the game is a breeze. Like most point and click games on iOS devices, you just double tap where you’d like to go and your character automatically finds its path to that location. Alternatively, you can tap and hold to constantly move in whatever direction you’d like. Completing the adventure requires the use of two distinct modes in the game. 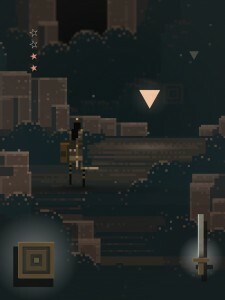 Tapping into “sworcery" mode involves holding the iPad in a horizontal orientation and holding your finger on your character until she begins to “sing the song of sworcery." At this point, you’re able to interact with the game world to solve the various puzzles you’ll come across. 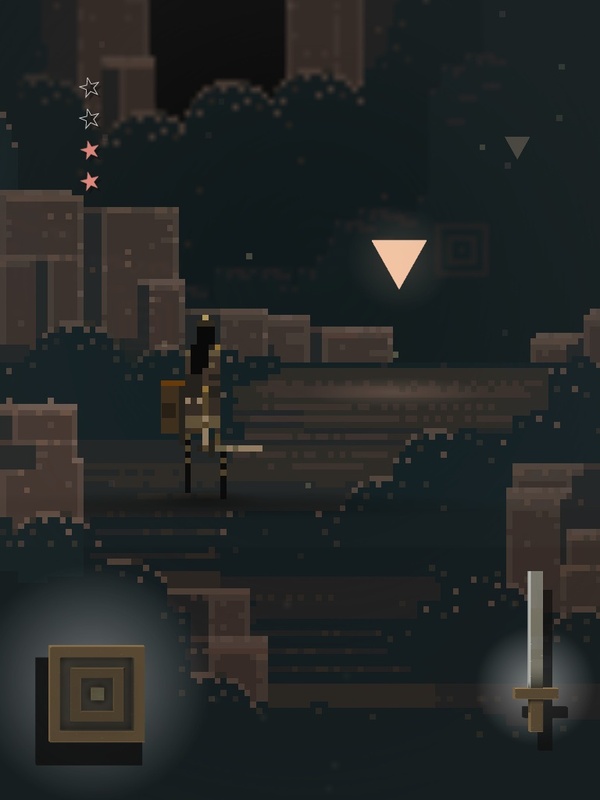 The second game mode, “sword," requires rotating the iPad 90 degrees into portrait orientation. Your character then draws her sword, and buttons both for blocking and attacking appear. There are parts in the game that require you to simply draw your sword and hold it to the heavens and parts which are fairly intense battle sequences. These fights are reminiscent of Punch-Out!! and are largely based on figuring out what pattern of blocking and attacking you need to use, as well as timing each of those movements. During GDC this year there was some discussion about some people not liking that the game forces you to turn your iPad to switch between these two modes as it feels a bit clunky on a device as large as the iPad. To some extent, I agree, but at the same time I really like the distinct and deliberate shift in “modes" that comes from the physical rotation of the device. I do have a feeling this will be a lot better on the iPhone version of the game, as rotating your phone seems much more similar to drawing a sword as opposed to rotating the iPad, which feels much closer to driving a bus. 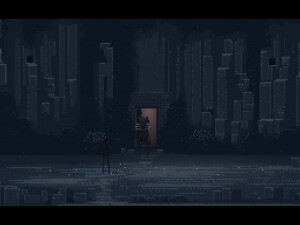 If you want to stop reading now to avoid spoilers, I’ll leave you with this- Sword & Sworcery is a fantastic adventure game. I totally recommend checking it out, if for no reason other than to experience how well great pixel art and amazing music can meld together to create something really cool and at times, entirely unexpected. The plot of Sword & Sworcery follows the adventures of your mysterious avatar, The Scythian, who somehow finds herself far away from “the war-ravaged steppes of Scythia." You soon meet the mountain folf of the Caucasus: Dogfella, Girl, and Logfella serve as the supporting cast of characters for your adventure. Each are fairly mysterious, which leaves you constantly wondering what they’re up to, why they’re just hanging around, and the greater role that they may or may not serve in your quests. 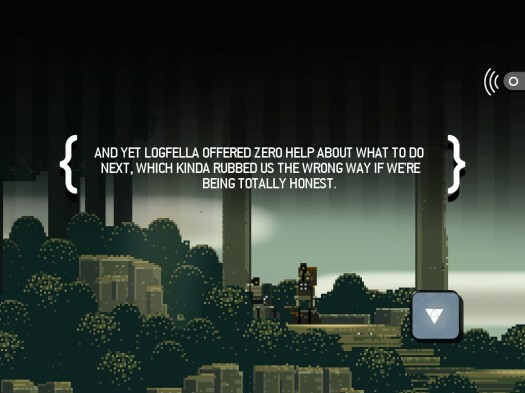 In your first encounter with Logfella, he mentions hearing of the “woeful errand" you’re on, which sets the stage for how the rest of the story is told. As the player, you’re playing somewhat of a god of sorts and the story has to be pieced together in your own mind as you read which characters in the game are thinking what or saying to themselves. It’s a neat way to present an adventure game, and the layer of abstraction between the player and the characters really seems to shift the focus of the game to discovering the game’s world than developing characters. This is further enhanced by the art style, which basically begs you to look around and really take in every location you find yourself in, while listening to the perfectly paired soundtrack. 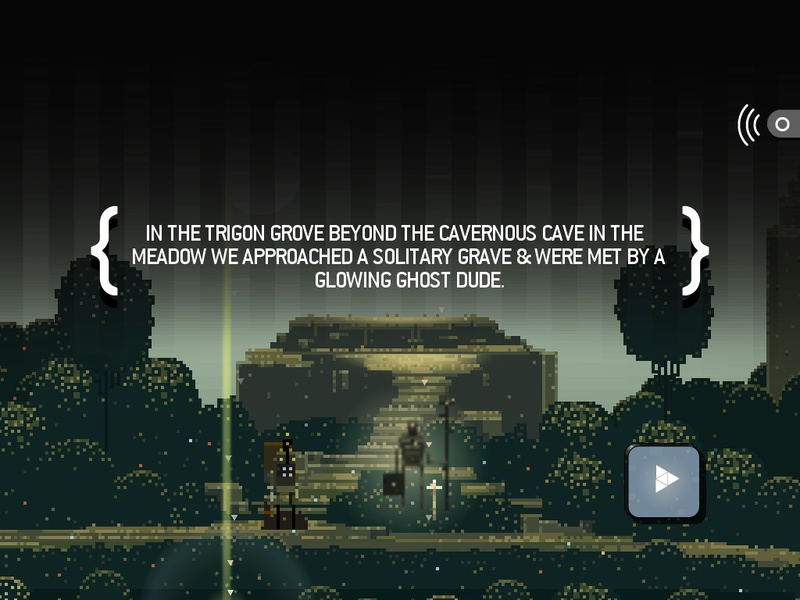 The introductory quest in the game reveals the over-arching quest which will drive the rest of the game: Acquiring and destroying the “burdensome book of sinister sworcery known as the Megatome", all while dealing with the “deathless spectre" which was awakened when you removed the Megatome from its resting place. As you deliver the Megatome back to Logfella’s cabin, a storm starts brewin’, symbolizing just how evil the Megatome actually is, and you even start getting some hints on the effect the Megatome is having on the Scythian. The upshot is: having the Megatome allows you to read the thoughts of the characters in the game, further unlocking additional tidbits of information about Logfella, Dogfella, and Girl. The downside is that destroying the Megatome is fairly involved, and requires both unleashing the Sylvan Sprites and collecting the three pieces of the Gold Trigon. To free the Sylvan Sprites, you’ll need to wander around the game looking for little patches of bubbling light. Summoning them from their slumber involves singing the previously mentioned song of sworcery, then solving environmental puzzles. These puzzles are musical in nature, and often have to do with figuring out which objects in the game world are interactive, then forming a musical scale in the proper order by tapping them. It’s really awesome how this all goes together with the overall musical nature of the game as well, with a favorite puzzle of mine involving strumming waterfalls as you correctly order notes played on a harp. Keep in mind that if you don’t have a musical background, some of these puzzles will likely be difficult, potentially frustrating, and might just come down to brute-forcing the solutions. Waking all the Sylvan Sprites reveals a piece of the Gold Trigon, and in order to collect it, you’ll need to battle it first. These battles are crazy, filled with lightning, cool music, and multiple phases that require precise sword swinging and dodging. Acquiring the first piece is simple enough, but the second and third can only be gathered in specific real-world times under a full and new moon. There are two ways to avoid this restriction. The first is in-game and requires some exploration to find. Alternatively, you can just cheat and roll the clock in your device forward to the next full or new moon. This real-world tie in and constant focus on the moon adds an additional layer of depth to the game, but more than anything else, seems to serve as a bit of a forced break from playing. My initial play-through was, as the game recommends, done while I took breaks between quests and waited for the moon cycles. Not only did this avoid the somewhat inevitable feeling or repetition you get with adventure games from so much back-tracking, but it was also really neat to say, “Oh hey, full moon tonight, I wonder what’s going to happen in Sword & Sworcery." I realize not everyone is as patient as I am, but the whole experience, when played as the developers intended, is really rad. 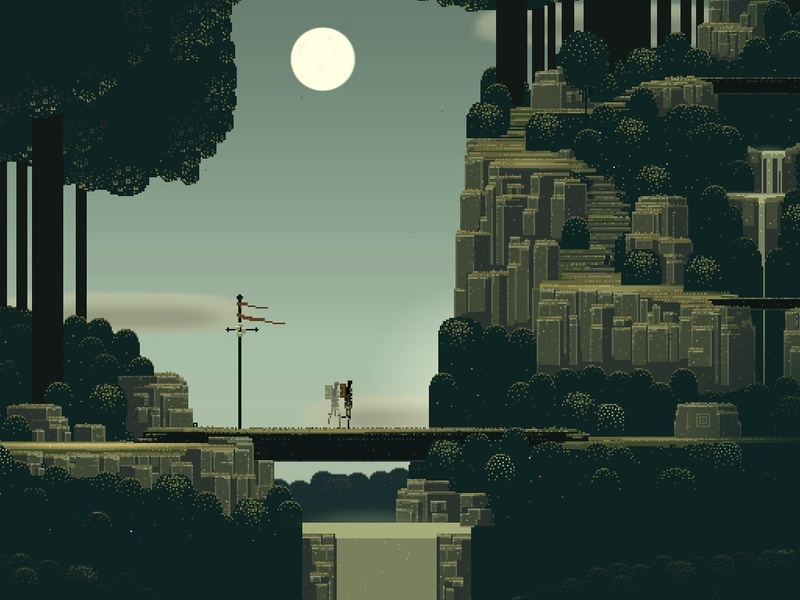 Sword & Sworcery is an incredibly unique composition that almost makes you want to analyze it as if it were a movie rather than a video game, which not too many iOS games have ever made me do. Throughout the game, you’re constantly delving into themes of discovery, sacrifice, and playing with the crossover between dreams and reality. The beginning of the game drops several hints that the Scythian’s quests to destroy the Megatome will make her a martyr, so it isn’t much of a surprise when the inevitable occurs after an insanely amazing ending sequence (which I don’t think I’ll ever forget). However, it’s very strange how this plays out. 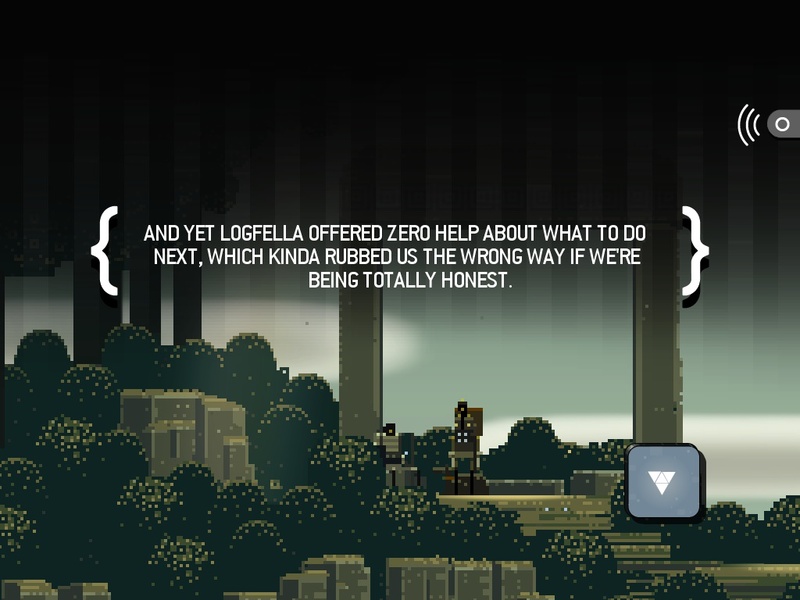 For me, what I questioned most while playing Sword & Sworcery was the motivation behind why the Scythian was doing what she was doing, who Logfella and Girl are, and other natural character-driven enquiries. As mentioned previously, you play the role of a silent god of sorts who just so happens to be able to control the Scythian, and the only depth you’re able to get out of these characters is what the game gives you. Since everything is meant to be tweeted, all of the thoughts and dialog are less than 140 characters. This, combined with the amazing art style of the environments causes you to focus more on the game world as a whole rather than getting invested in any particular character, even the Scythian which more or less serves as your avatar. Initially it seems like the game panders to this as well, often seizing control of the camera to pan around the lush forests and reflective ponds. The shift in the latter half of the game to focus on the Scythian’s sacrifice doesn’t feel as powerful as it should because you’re lacking a solid connection with the character. You never really get much of an understanding of why she’s doing what she’s doing other than because the Megatome is bad, and it’s your duty to destroy it. Stepping back a bit, it’s incredible that Superbrothers have created something that has me thinking about it for so long after playing it. iOS games are notoriously disposable time wasters, and I can’t think of many that I’ve beaten then actually sat around and discussed with friends on a thematic level. Hell, I can’t think of many iOS games where you can even do that. 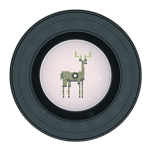 That alone, stripping out and disregarding everything else that makes Sword & Sworcery so great is an accomplishment in itself. If you’ve got an iPad, you’ve made it this far and your review and your interest in this game is even mildly piqued, you need to download Sword & Sworcery. It’s by far one of the most unique games I’ve played on my iPad, and I really hope the game does well enough that the developers are able to turn it into a franchise. 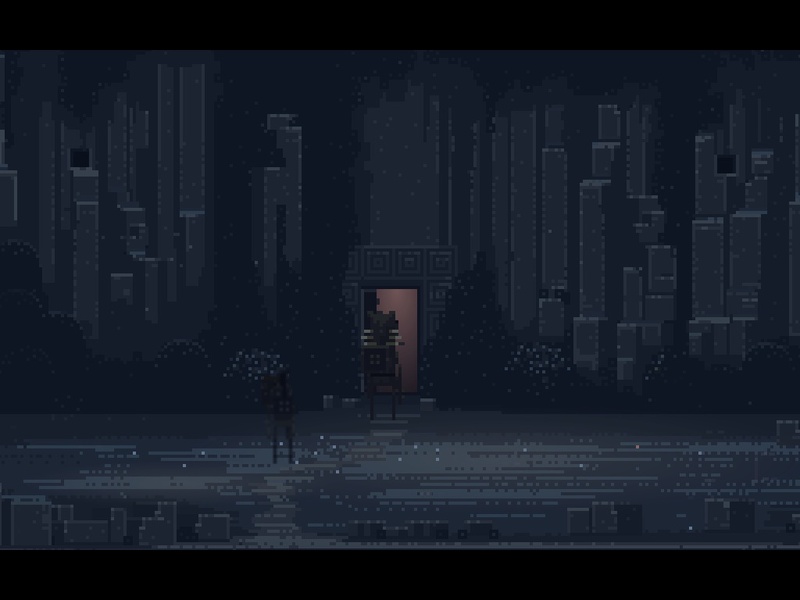 There is just so much more they could easily explore in the Sworcery universe, and I can’t wait to delve further into it.